Sandakphu Trekking is great to discover the Darjeeling. If you think Darjeeling gives you the grand experience of living in the mountains, wait till you reach Sandakphu and realize the ultimate grandeur of life in the high mountains where nature is at her pristine best. Located at an altitude of 3,640m, Sandakphu is the highest peak of the Singalila Ridge and the entire state of West Bengal, no doubt you shall witness the most visually stimulating view from here. What if I tell you that you would see four of the five highest mountains in the world? Yes, the peaks of Everest, Kanchenjunga, Makalu and Lhotse all appear at the horizon and would baffle your eyes. The grandeur of snow capped mountains, battalions of colorful wild flowers like primulas, rhododendron, magnolias, orchids and many other sub-alpine flowers, the melodic chirp of birds filling the air and the fresh green smell... soaking in all of this would definitely elate all your senses. Of course you will have to make an effort and trek uphill to experience this ‘top of the world’ feeling but we assure you it is definitely worth all the effort. Should you ever plan to undertake this trip on your own, here is our recommended Sandakphu trek map and itinerary that you can finish in 6 days. 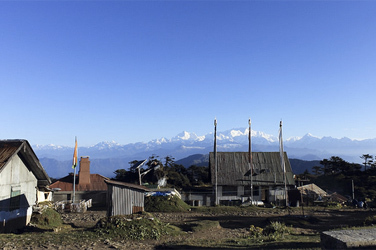 As you plan your travel to Darjeeling, make sure you don’t miss out on Sandakphu trekking or Singalila trek. Day 02 : Delhi – Bagdogra (by plane) – Darjeeling (2130m) by car. We could take an early trip to Tiger Hill to see the sunrise. Afterwards we visit the famous Ghoom monastery that enshrines an image of the Maitreya Buddha (the coming Buddha). Later on we can visit the Himalayan Mountaineering Institute and tea plantations. Overnight in Darjeeling. Early morning drive from Darjeeling to trek point. The trail overlooks the Bengali plain south, and we have tantalising glimpses of Kanchenjunga ahead, as we zigzag through rhododendrons. Day 05 : Tonglu – Garibas (2620m) in 4hours. We take a mossy paved path, that snakesthrough a succession of forests and hamlets, giving way, from time to time, to spectacular mountain sceneries. Day 06: Garibas – Sandakphu (3640m) in 4h 30 min. We steadily climb to join the ridge trail towards Kalpokhari. Afterwards we start a long and steep climb onto the Singalila ridge that leads us to Sandakphu. A remarkable 360 ° view from the top. We walk to a prominent viewpoint for the magnificent sunrise over the Kanchenjunga, Jannu, Everest, Lhotse, Makalu and Cho Oyo. Throughout the day, there are ever-changing views: yak herds, silvery pine forests, tiny lakes ringed with grass, and the snow-capped Himalayan range in the background. Day 08 : Phalut – Raman (2560m) in 5hours. A pleasant descent through the woods takes us to Gorkhey (2500m) then we climb up towards Raman. Day 10 : Departure to Bagdogra / Bhadrapur Airport Drop.